SHF is offering two different solutions, one being compact and cost effective and one being as fast as possible. 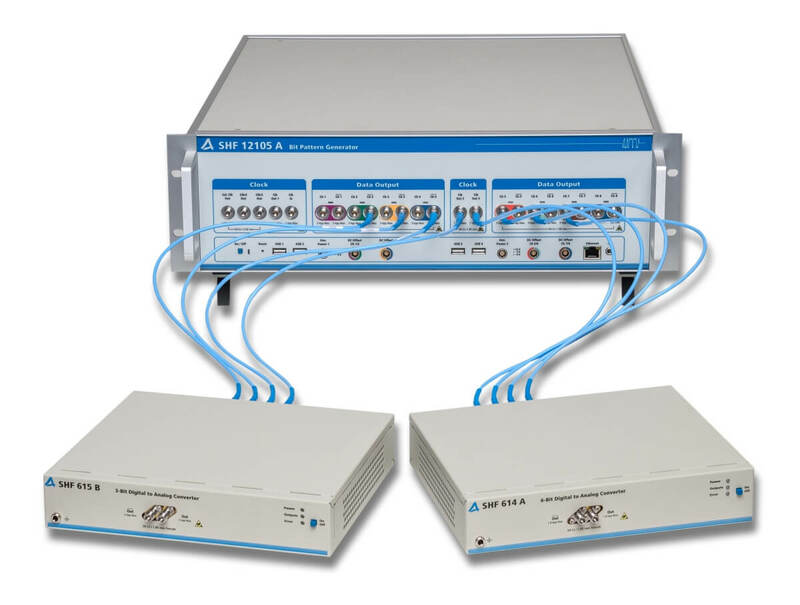 The “compact bench-top AWG” is a cost effective Arbitrary Waveform Generator with up to 2.85 GSa/s and 14 bit resolution, housed in a small and light weight chassis. At its front panel, three outputs with different coupling, bandwidth and offset adjust features are available. In addition, four pattern generator (BPG) channels are located at the rear panel of the instrument. Combining a SHF bit pattern generator (BPG) with one of SHF’s digital to analog converters (DACs) converts the system into a multi-channel PAM source. With these BPGs one has full control of the patterns into the DAC (due to the huge memory and the channel synchronization). Therefore, our BPG-DAC combination can be seen as a full blown remote head non-interleaved 60 GBaud Arbitrary Waveform Generator (AWG). For PAM signals, it is faster than any other AWG instrument as it samples only one single time per each bit. Thus the baud rate of the resulting PAM signal is as fast as the sample rate of the system.